The story of this beautiful oak tree began in the mid 1980’s! Members of Edmond First United Methodist Church planted a tree east of the sanctuary on Hurd replacing a tree damaged due to severe weather. The beautiful oak stood stately near the main entrance on Hurd adjacent to the sanctuary (which is now the entrance to the Main Building Foyer). The oak’s beauty and its seasonal kalidescope of colors was enjoyed by members, UCO students and others who passed by the church daily for almost thirty years. Now for the rest of the story! Fast forward to 2013. First UMC began to grow and flourish in making disciples of Christ! The decision was made to expand the existing 1928 historical building. After a successful capital campaign, the planning committee spent endless hours in meetings, designing and preparation for the expansion to begin. Members soon learned the beautiful oak would have to be removed due to the expansion. Ideas and many discussions became the focus on how to preserve the legacy of a beautiful oak prior to removal of the tree. Could such a beautiful oak be preserved so its legacy could be enjoyed by First UMC as well as glorify God? Absolutely! A small, self-appointed committee began the process of preserving the wood so a cross could be crafted to adorn the Foyer entrance of the new expansion. The architect accommodated a request to cut the tree into logs once constrction began in January 2013. Many thanks to Jo Logan, chair and the interior furnishings committee for working with Rosemary and Wayne Black, Jerry Cotton, Larry Cunningham and Kaye Dowell to move forward with a plan to preserve the oak. Following approval of the First UMC Trustees in October 2013, a final plan was in place to preserve its legacy which would be enjoyed for decades to come! When a timeline was in place to build the cross and you tell God your plan, you become humbled. Due to several interruptions, we then realized God had a another plan in how the project and timeline would evolve. Because of our trust, we knew He was with us every step of the way. We are thankful for God’s guidance and wisdom. Patience is a virtue and God’s timing was best because God was waiting for the right moment to bless us so we could appreciate the generous gifts presented to First UMC! During the entire process of removing the tree to the awesome craftsmanship of all the beautiful planks of wood (including scraps made into small crosses), we are indebted to all those who made the legacy of this beautiful oak possible. 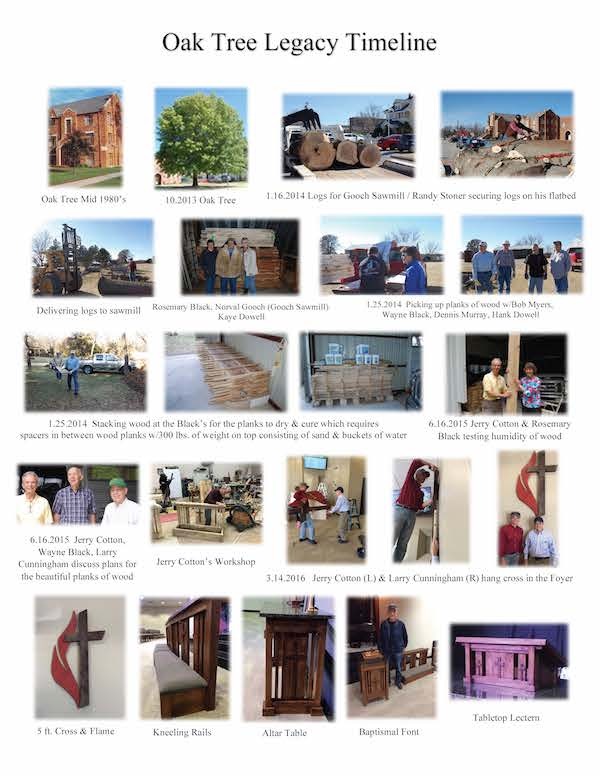 First United Methodist Church is blessed by the talents and skill of Jerry Cotton who made the Cross & Flame, altar table, baptismal font, kneeling rails and tabletop lectern. We are thankful and grateful for the gift of carpentry God crafted in Jerry’s hands. Larry Cunningham drafted the design of the Cross and Flame for Jerry’s use when he began making the cross. The beautiful cross now hangs in the Foyer entrance behind the Welcome Desk and the other pieces are located in Wesley Hall. Pictures speak a thousand words – depicted on the reverse side – and you can see how the legacy of a beautiful oak unfolded from 2013 through 2018! From the beginning to the end it was all about the cross! Older PostWhat is the Bigger Picture?